It takes a while to get your head around the generic cues and fictional world of this comical and fantastical neo-slave narrative. It flickers between an alternate history and (race) role-reversal satire, each seeming to conflict with the other. A long succession of gags about Africanised London place names – gags which are not particularly funny (such as Mayfah, Paddinto, Golda’s Green, Brixtane and, settled by Chinese seamen, To Ten Ha Ma) but which ultimately pay off with a geological reference to the Essex massif – clashes with a growing certainty that this Londolo is not in the country called England. And so you turn back to the map in the front-matter and everything becomes clear. Blonde Roots is not a role-reversal narrative in which everything stays the same apart from race relations, as in, say, Desmond Nakano’s 1995 film, White Man’s Burden. Nor is it an alternate history like, say, Steven Barnes’ Insh’Allah novels (2002–3), in which some not-unreasonable extrapolation underpins a relatively rigorously worked-out world dominated by an Islamic Africa for two millennia, and in which Europeans are the victims of an alternative Triangular Trade, abducted and sold into slavery in Bilalistan (as North America is called). No, what that map reveals is an alternative terrestrial geography. An island shaped like Britain (unaccompanied by Ireland), but perhaps larger and called the United Kingdom of Great Ambossa spans the equator off the western coast of north Africa, which is also located further south than in our world. It is not quite clear what has happened to the rest of Africa since it is squeezed off the edge of the map by a Europe, here called Europa, displaced to the south of the Gulf of Guinea. England and Wales, but not Scotland, are wedged into the gap between this relocated northwest Europe and Scandinavia. While it is entertaining to imagine a seasoned sf pro labouring to establish some geophysical perturbation causing this alternative dispersal of the Pangaea supercontinent, and in turn leading to this inverted social order, that is not where Bernadine Evaristo’s interests lie – nor is doing so as much fun as reading the novel itself. A comedy about slavery is no easy thing to pull off, as the disastrously misogynist and not terribly funny French timeslip comedy Case départ (2011), directed by Lional Steketee and its co-starring co-writers Fabrice Eboué and Thomas N’Gijol, demonstrates. But it is by no means impossible. Ishmael Reed manages it (more or less) in Flight to Canada (1976), as does Charles Johnson (less than more) in Middle Passage (1990). From the outset, Blonde Roots has some nice comic touches – in its world, the West Indies are called the ‘West Japanese Islands … because when the “great” explorer and adventurer, Chinua Chikwuemeka, was trying to find a new route to Asia, he mistook those islands for the legendary isles of Japan, and the name stuck’ (5) – but sometimes the comedy sits a little uneasily. For example, the protagonist, Doris Snagglethorpe, abducted from the Cabbage Coast (i.e., Yorkshire), transported to Great Ambossa, sold into slavery and renamed Omorenomwara, is branded with the initials of her owner, Kaga Konata Katamba, and his daughter, her first mistress, Panyin Ige Ghika. Omorenomwara, who hates Panyin, no doubt gets the PIG half the joke, but the KKK half – and the entire joke, if a white slave being branded KKK PIG is a joke – only works for the reader. Role reversals and inversions come thick and fast to begin with – monogamy is condemned by the polygamous Ambossans as ‘uneconomical, selfish, typically hypocritical and just plain backwards’ (19); house slaves are known as ‘wiggers’ (24); prosperous Ambrossan urban centres are known as ‘Chocolate Cities’ and ‘the tumbledown ghettos on the outskirts’ where ‘free whytes’ live in ‘squalor’ are called ‘Vanilla Suburbs’ (29) – but as the world is established and the narrative begins to come together, the comedy becomes less gag-oriented and Evaristo expands her comic vision to capture also the pain and tragedy. Misgivings fade. The novel switches between three strands: Omorenomwara’s present, as she attempts to flee on the Underground Railroad but ends up exiled to a West Japanese sugar plantation and must try to make some kind of life for herself there; Omorenomwara’s memories of her life as Doris and of her years as a house wigger; and an autobiographical pamphlet by Kaga Konata Katamba which includes his justifications for enslaving the self-evidently inferior Caucasians. Families and lovers long separated by the slave system reunite, sometimes only fleetingly, and a sense of community thrives among brutalised slaves because they are dependent on each other. And in this final section of the novel, Evaristo gets the tone perfect. She reproduces that tired old cliché of slaves singing together in the fields, but makes it clear they do so out of mutual care and to support each other, not because they are happy. She shows them singing on command to welcome their visiting owner, and counterpoints it with them singing for themselves. And she includes the eleven-year-old slave Dingiswayo, ‘strutt[ing] about the quarter in a pair of outsized, hand-me-down cotton pants worn so that the waist hung (somehow) beneath his bum’ (204). There is always a danger with role-reversal satire that the reader or viewer’s sense of injustice will be aroused for the wrong reason. Not by patriarchy and misogyny, but because men are being treated like women. Not by slavery and racism, but because people of pallor are being treated like people of colour. 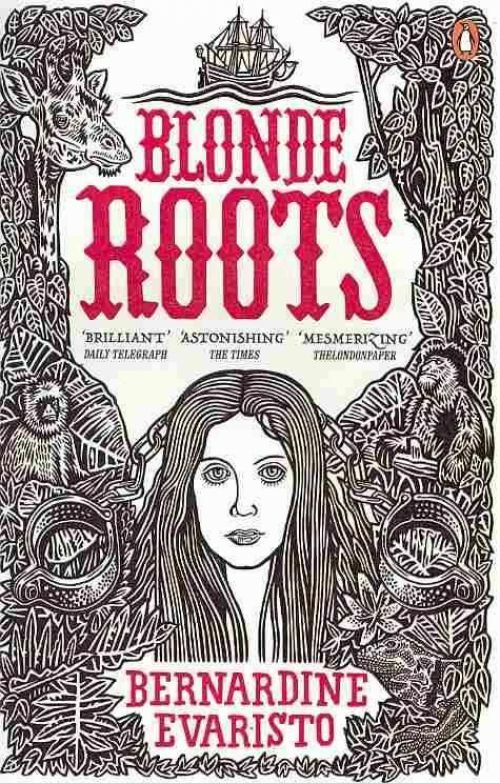 Blonde Roots’ fractured structure of narrators and temporalities helps it to avoid this pitfall, but for me there was something else, something curious, going on. I kept forgetting that the slave characters were white. I suppose this is because the novel mostly uses their Ambossan slave names, rather than their European names; and because so much of the cultural imagery around slavery features enslaved Africans; and because, being a novel rather than a film, there was an absence of concrete visual detail to fix their appearance. Then every few pages I was brought up short as I remembered, as this potent anamnesis – this remembering of things forgotten – swept over me. I have no idea whether the novel will work in this way for other people, and I have yet to figure out what it means. But it was powerful and disorientating. The way a good book should affect you. Looks like I need to read this one! As always, you’da man!